Many years ago, I had an HP Printer and it worked great. It sat there quietly just waiting for someone to send it a print job. Once it received an order, it printed the document with no issues. The only things I had to check were; did the printer have paper in it, was the correct paper in the printer, and was printer turned on. HP made this printer so well it lasted for more than a dozen years. I had to stop using the printer and purchase a new one because HP tried to encourage the owners to buy a new printer by no longer making a printer driver for it. My current printer is a Epson Photo Printer. The more the industry makes printers easier for the general public to use, the more complicated they make it for us who want to print impressive items. There were two projects that I was trying to print. One was a photo I edited with Corel Photo-Paint and the other was my Christmas Cards. Challenge one: Printing the photo on metallic paper. Challenge two: Printing the cards on high quality paper. Make sure the color conversion is being done by the program, not the printer nor the default computer driver. The printed colors may be different from what you intended. 2. For a better print, you may need to designate a color profile. I used the Premium Luster for the Metallic Paper. 3. Select the correct paper type. Select “High” Quality for detailed work. And, turn 2-sided Printing “Off” because we want to give the front side time to dry completely before printing the reverse side. Yes, I was dealing with thick paper. I learned after my prints were smearing, that envelopes are considered “thick”. If an envelope is thick, maybe I should consider most paper, such as card stock, photo paper, and envelopes as thick. There is a setting on the computer to tell the printer you are using thick paper. Basically, it slows the printing down to allow the ink to dry. I did a web search to find the “Thick Paper” setting. It was little help. I found it by looking at all the settings. It is located under the “Maintenance” tab under “Extended Settings”. Select the check box next Thick Paper and Envelopes. Epson only recommends turning it on if the prints are smearing, because it slows the printing down. If your prints have smeared, you probably need to clean the inside of the printer. Yes, the printer is designed where you can not take it apart and use a cloth to clean the inside. To clean the inside: Do not place any document on the scanner part of the printer. Press Copy on the printer and make blank copies until the paper comes out clean. For me, this was about 10 copies. For smeared prints, you may want to slow down the printing speed to give the ink time to dry to produce a higher quality. To do this, turn off “High Speed” by removing the check. After all the smearing of ink, I decided it was best to clean the print nozzle before I attempted to print anything else. This is done directly on the printer. Success! I got 20 prints with no smearing. When I have the time, I usually make all my Christmas card. My first card I made was in 1996 using CorelDraw V3. Recently, the cards have been getting more and more elaborate. No matter what I do to the card, the background and inside writing is usually done with CorelDraw. The idea for the card came early this year. The background is already done. The problem is to complete the idea will require a lot of cutting and embossing. And, I never done embossing! I decided to purchase a machine to do the cutting for me. I looked a many models and decided on the Silhouette Cameo. What I liked about it was, the software it came with, Silhouette Studio, I could use it with SVG files (for an added cost), and I could used it with .CDR files (for even more cost.) It had decent reviews, so I waited and considered this purchase. Then I saw the newer model, the Silhouette Curio. It has more functions, like cutting thicker media. I may need that. It embossed. The only things the reviews didn’t like was the smaller cutting mat and the instruction manual was difficult to read. The cutting size wasn’t a big deal since it would be my first machine, something to learn on. The reviews were correct about the manual. It is difficult to read. You can find my experience with the Silhouette Studio software here. In this posting, I will continue with the review the device. The Curio comes with: USB cable; power cable; two blades, cutting and embossing; print and emboss squares; Software CD; base with cutting mat and embossing mat; material fasteners; replacement snaps; and instruction book. Setup of the machine was easy, basically just unbox it, install the software, and plug it in. However, the USB Cable and Power Cable plugged into the right-side of the machine. If your PC is located on the left-side of the machine or located on the floor, the USB cable may not be long enough to reach it. You may want to consider getting a USB Extension cable. Loading the mat into the machine took some figuring out. The instruction manual was not clear, but it was helpful in recommending to remove out film from cutting and embossing mat. To load the cutting/embossing boards on the mat properly, refer to the Cut Settings in the Silhouette Studio software. You will need to turn off the Curio every time you load and unload the board from the machine. The cutting blade needs to be adjusted according to the cut settings. This is done by using the cap to turn the blade setting. The blades loaded into the device as expected. I turn the knob to insert the blade, then I turned it again to secure them in place. Each cut and each emboss, I am learning more about the device. 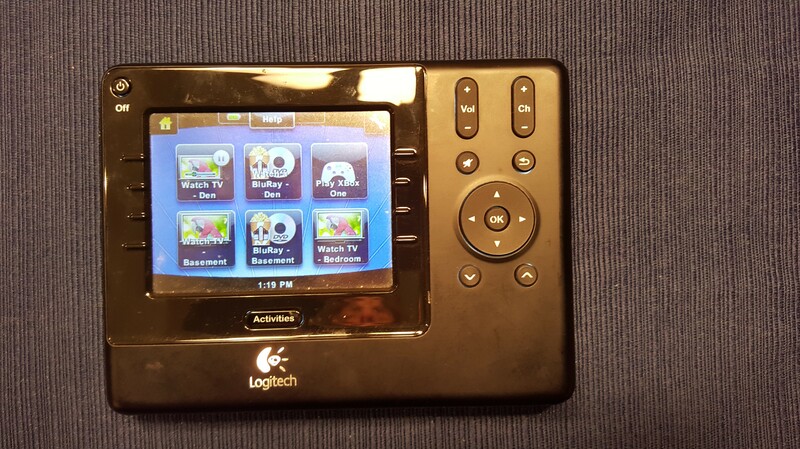 Several years ago, my husband gave me the Logitech Harmony 1100 Remote as a birthday present. You are probably wondering why a wife would get such a gift. Why didn’t he just purchase jewelry? Well, you see we both are techies, and for years, both Christmas and Birthdays, I have been getting computers, hardware, software, and all kind of techie gifts. Techie gadgets are some of the best gifts around. During my move, I got rid of some TVs, and related devices, and got some new ones. The time had come to reprogram my Logitech remote. The computer that previously had the Logitech software on it died, shortly after the move, so it was necessary to reinstalled the software. My Windows 8.1 PC was selected to have the Logitech install the software. I went to Logitech.com and located the software for my remote. It took some time to find because it wasn’t listed under the current models. The software downloaded and installed without any issues. The major issue was getting the Brand, Model Number, and Input off of three TVs, two Blu-ray’s, and two cable boxes (DVR Device). This process was simple with the Samsung Smart TV. If you access Support > Get Help from the menu, it provide the information. The same was true for the Samsung Blu-ray’s. For the other devices, I had to get my glasses and smart phone out to read the model numbers. Its a good thing my smartphone camera has a good zoom. The next step was programming the remote. First define the devices. That was easy because I took the time out to get the information before I started. It basically prompted for the Brand and Model. I made sure when I was setting up the cable boxes, to select the option “Never to turn off the device.” This is important because I want it to record the shows I have programmed. Then I renamed all the devices, because having three devices listed as TV gets very confusing. Setting up the Activities was next. An activity is something like “Watch TV”, “Play DVD”, etc. This was the most time consuming part, because you have to think through the entire process. I also selected to set up each activity manually because having so many devices, the remote software often selected the wrong device under automatic setup. These are the typical steps for setting up most activities. What device will you watch video on? What device will you use to control volume? Review this settings, are they correct? I renamed each activity, after they were setup. It has the same problem as the default device name. After all the activities were setup, I rearranged all the activities. They will appear on the remote in the order that they appear in the setup. The next step was sending the programming to the remote. I already had the remote plugged into the USB port on the computer, so pressing the send to remote button was all I had to do. This process took several minutes to complete. Finally, the testing mode. It was unplugged from the USB and tested it on the devices. It worked on all the TVs, Blu-ray’s, and the cable box stayed on. However, it didn’t work on the XBox. But, I the program did warn me “You will not be able to control this device.” Oh, well. I will work on the XBox later. Logitech recommends that you dedicate at least 30 minutes to setting up the remote. My experience is that is takes about 10 minutes to install the program and another 10 minutes to set up each activity. So, if you are going to be programming six activity, you should probably give yourself at least an hour and a half to setup the remote. The only issue I have with the remote is that any movement causes the screen to come on. I usually end up laying the remote face down when I am watching TV.